Pronexus VBVoice IVR Blog | If It Ain’t Broke – Upgrade! We love to hear from our customers that our IVR software is providing them with an awesome experience. We strive to deliver solutions that work so well, you can literally forget about them. HOWEVER – we regularly have customers tell us that (against our advice) they "will not be upgrading to the next version of VBVoice, because the version we have works so well." Yikes! While we are thrilled that legacy versions of our software continue to function flawlessly, we also know that no software platform will live forever. Some things in life are just for certain – death, taxes and obsolete software. Unfortunately, old software typically runs on old hardware. If that hardware fails, your solution fails. The question you should ask yourself is not "How much is it going to cost to upgrade?" but rather "how much will it cost if I don't upgrade?". Weighing the cost of upgrading against the potential cost of not upgrading is a great way to establish the business case for the upgrade. Extensive retraining for staff on the new software – when things have changed drastically with the software, the need for training is often a burden. Hardware upgrade costs and compatibility – if your server hardware or even a media card fails, you may be forced to order replacement hardware that will naturally come with the latest Operating System available. Your legacy version of VBVoice or your media card may no longer be supported and compatible with the latest Operating System – making your upgrade process a sudden emergency instead of a routine procedure. Downtime due to outages if/when the software fails – an unpredictable failure of software that is not supported by the vendor due to out of date product can prove very disruptive – unfortunately, a few customers have experienced this and it is never fun for anyone. Downtime of the solution while new software is procured – downtime is the enemy of any IVR solution, and can so easily be avoided. Integration upgrades can create a myriad of unexpected hurdles when it comes to software licenses, configuration changes and deprecated software functionality. Significant planning is involved in the development and release of IVR software to ensure that it is compatible with the latest platform and telephony drivers. Your VBVoice IVR application relies on these elements to function correctly at the time of the VBVoice release. 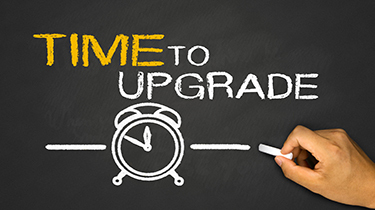 Regularly upgrading allows you to spread potential costs – such as hardware updates – across several new releases, and avoid many altogether. Failure to stay current, on the other hand, introduces the risk of facing many or all of these expenses at once. If you manage software, think of upgrading as a routine part of your responsibility and an insurance policy that you wouldn't consider living without. Don't live on the edge and tempt fate – software is fallible. Software gets old. You will one day HAVE to replace it. Don't wait for that day – upgrade now while you are in control of the expense, you can assess your options, and you can estimate the possible downtime and eliminate the risk for operational inefficiencies by allowing your software to break down. So when should you upgrade? When it ain't broke. CLICK HERE to upgrade to the latest version of VBVoice. NEW AROUND HERE? Download the latest version of VBVoice HERE.